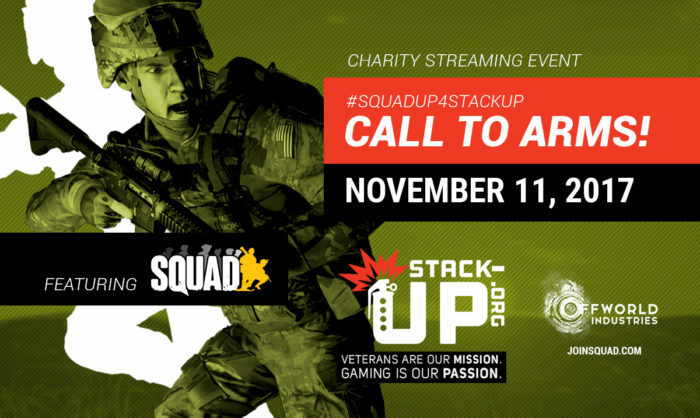 Stack-Up for Veterans Day 2017 : Squad – Communicate. Coordinate. Conquer. Veterans are at the very heart of Squad: they’re at the heart of both the team and the community. We simply wouldn’t have Squad without our veterans. With that in mind, we’re looking forward to another Veterans Day celebration in conjunction with Stack-Up.org. On Saturday, November 11th, 2017, we’ll be showing off some of the best Squad has to offer and what’s changed since last year. You’ll be able to get a glimpse of some of the hottest competition in Squad, chat with Offworld developers, and maybe even snag some prizes. Best of all, Stack-Up is a charity that’s by gamers, for gamers. Ain’t nothin’ wrong with that! So join us on November 11 for the Stack-Up for Veterans Day. We’re honored to be part of the action! We’ll be kicking things off at 10:00 AM PST and running until about 8:00 PM PST. The ISKT all-stars have challenged OWI developers to field a squad — Challenge accepted! Giveaways! We’ve got some hardware and some softer wares to share! For our international squaddies that won’t be able to tune in: be sure to submit your questions for the development team in advance! All you need to do is comment in the related thread with your questions about mapping, modding, Squad development, or Squad developers. Video will available after the event, so you can check out the answers at a more reasonable hour with a proper cuppa. Along with the free weekend, we’re working with our hosting partners Bluefang, Fragnet, HostHavoc, Gamerzhost, PingPerfect, and Vilayer to ensure we are ready to rock for the influx of new squadmates. The Squad community is filled with veterans of all generations and we are very fortunate to have the opportunity to play our game with them on a regular basis. They’ve become the backbone of many of the best communities and clans and we greatly appreciate their passion for Squad. We have four of our own who have served in various roles for their respective militaries and it is the least we can do to show our commitment to them as developers and partners. Special thanks to our streaming partners that made this event possible. They include, but are not limited to CCFN, ISKT, NAS, Squad Ops, DesmoLocke, Haynick31, runningDuck, and everyone who’s given their time and love to Squad.